The White tailed deer, (Odocoileus virginianus,) was adopted in 1957. Although badgers have been associated with our coat of arms, the state flag, the University of Wisconsin, the official seal and Cornish miners since the days of the Wisconsin Territory, it was four elementary school students from Jefferson County who discovered the animal had no official status in Wisconsin. You would think the badger was the only logical choice for state animal. In 1957 a compromise was reached, the American badger (Taxidea taxus) was named the state animal and the white-tailed deer (Odocoileus virginianus) was named the state "wildlife animal." See Section 1.10 of the statutes. 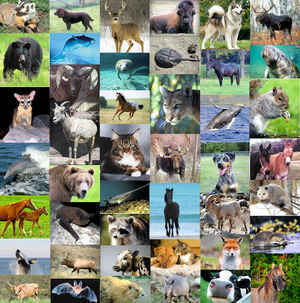 In Chapter 209, Laws of 1957, it named the badger the "state animal", and Chapter 147 designated the white-tailed deer as the state "wild-life animal". The white-tailed deer is a large, brown animal found throughout Wisconsin. 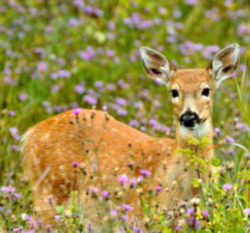 Deer prefer to live near forests and agricultural areas, such as crop fields, because these areas provide food and cover for them. Deer have hooved feet, slender bodies, and long, thin legs. Don't let their skinny legs fool you. Deer are able to run up to 40 miles per hour, jump 9 foot fences, and swim 13 miles per hour. There are 16 subspecies of white-tailed deer in North America. 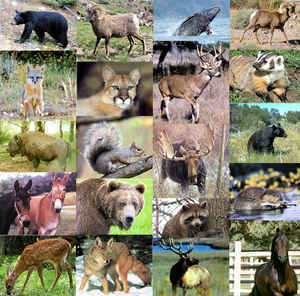 Subspecies are distinguished by geographic location, body size, coloration, antler growth, and physiological, biochemical, and behavioral differences . The genus name Odocoileus is from the Greek words odon (tooth) and koilos (hollow) or "hollow tooth," in reference to the depressions in the crown of the molar teeth. The Latinized species name virginianus (of Virginia) refers to the state from which the species was first collected and described. 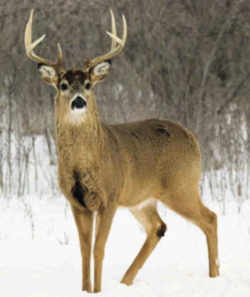 (j) The white-tailed deer (odocoileus virginianus) is the state wildlife animal.